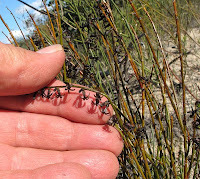 This species is easily overlooked as it is short and broom-like (leaves reduced to scales) and has dark brown flowers. It was originally placed in the Stackhousiaceae family, but has now been absorbed (with the rest of the old family) into Celastraceae. 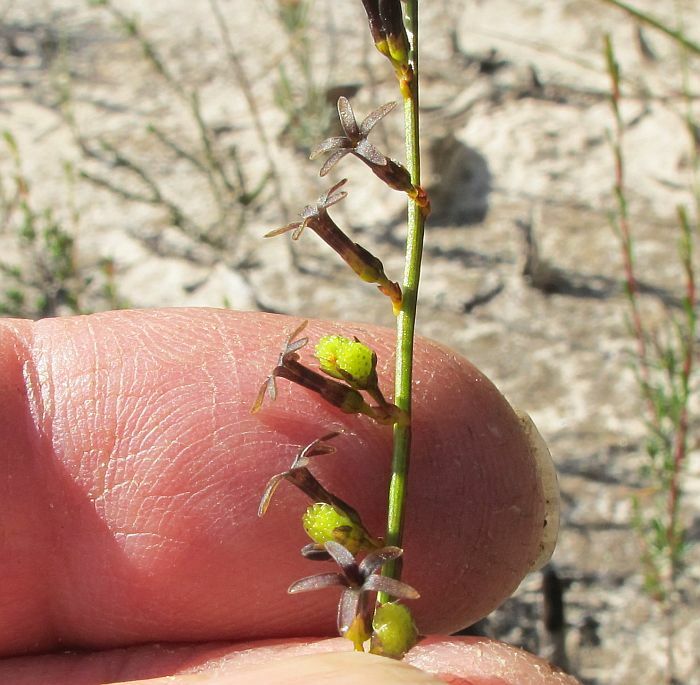 When I first encountered Stackhousia scoparia, I thought it was a Tripterococcus (also from the Celastraceae family), but fortunately it had seed capsules that are a different shape to that genus (see Tripterococcus brunonis in lower right column), which are strongly winged. Stackhousia scoparia grows to 60 cm (2’) in height, but is mostly shorter and can be locally common after bushfire when plant competition has been removed. 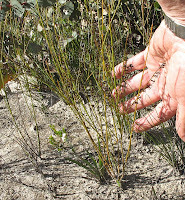 In the Esperance district it has a preference for sandy hollows where the soil has a higher clay content than higher surrounding ground, although it is recorded growing on gravel and laterite elsewhere. 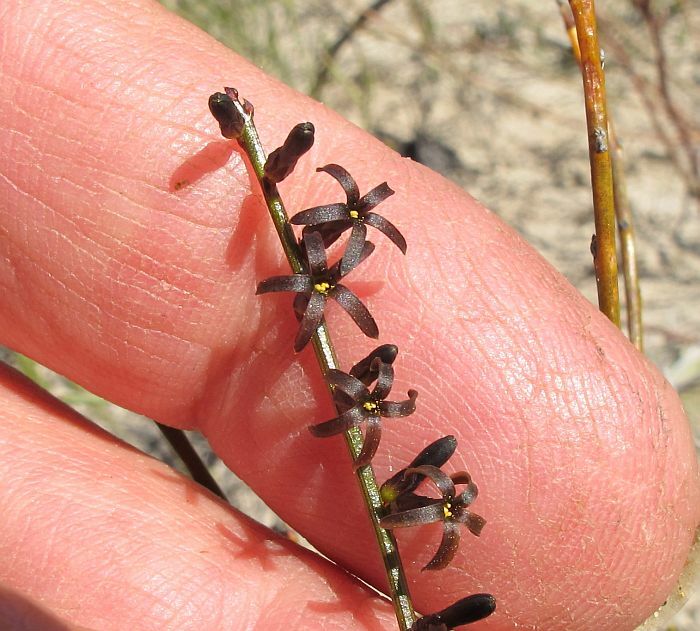 This species is predominantly an inland one and occurs in mallee country to the North and NE of Esperance, and at these and higher latitudes, ranges west to the Perth region. The tubular brown flowers (also green/yellow to yellow/brown) are around 5 mm (under ¼”) in length, but are not unattractive when closely examined and would require something like a butterfly or moth with a long proboscis to pollinate them. 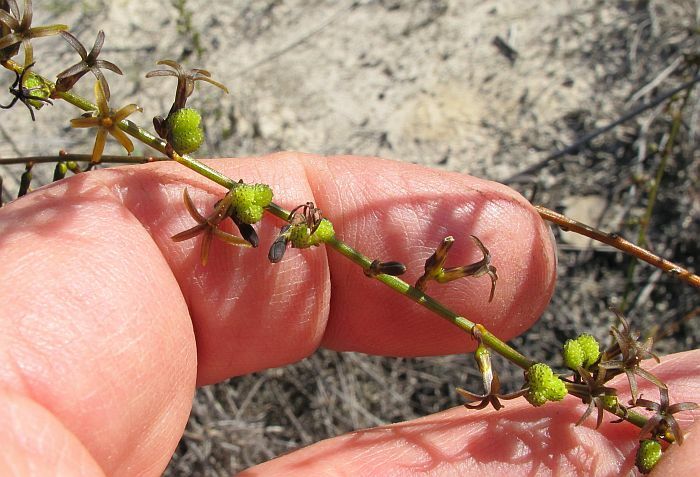 Unlike its larger flowered and very common relative Stackhousia monogyna with its radiating candle-like flower spikes, the flowers of Stackhousia scoparia are grouped along one side of the stem. 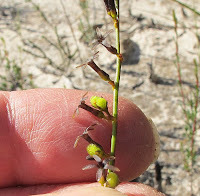 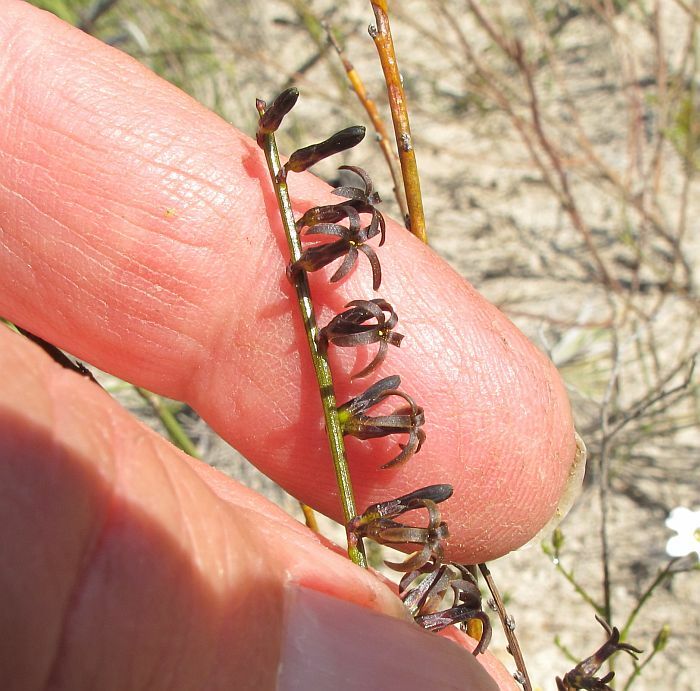 The distinctive seed capsules (cocci) are rounded, but deeply wrinkled or covered in tubercles (as illustrated) and as proof, will produce additional flowers in the advent of later storms over the irregular mallee rainfall region. Therefore depending on weather conditions, Stackhousia scoparia can flower anytime from August to January.